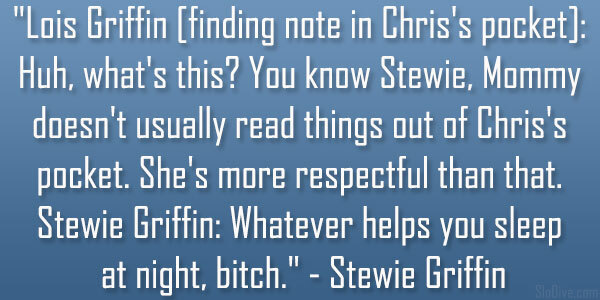 Stewie Griffin is a popular character from the super hit animation series, ‘Family Guy’. 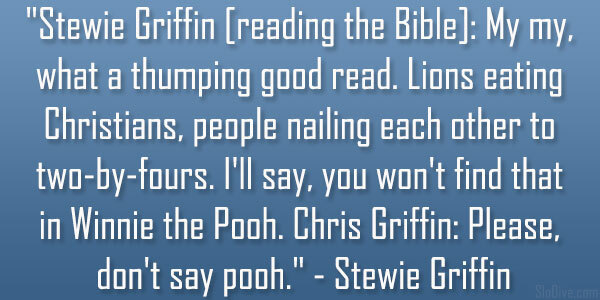 The baby of the Griffin family enjoys dark humor and witty sayings. 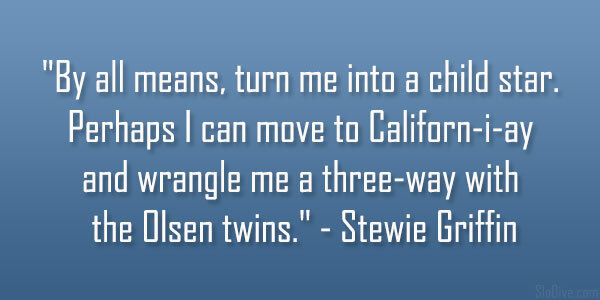 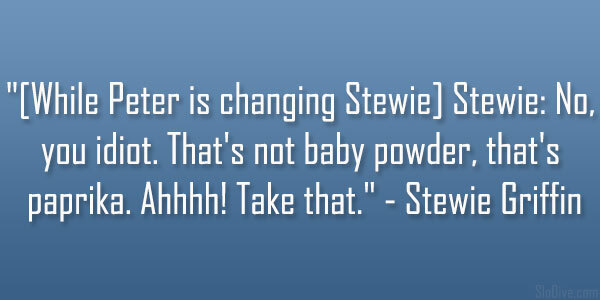 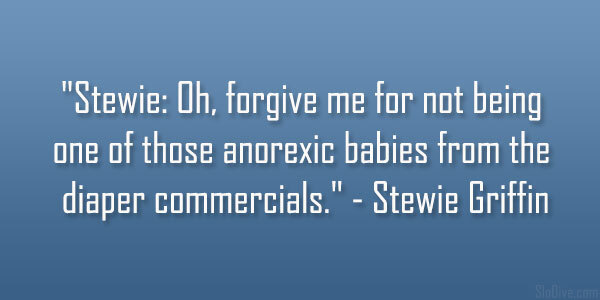 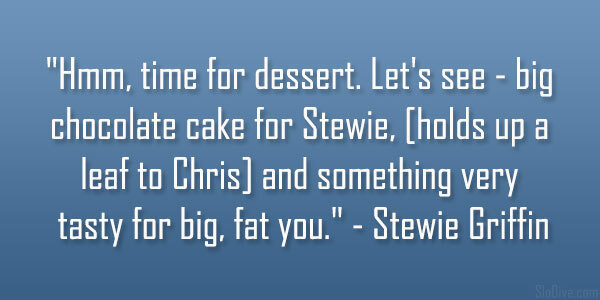 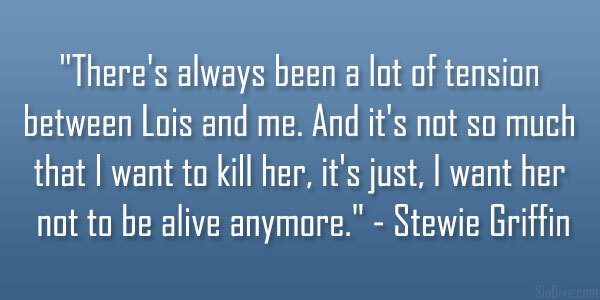 Stewie is known for being totally different from sweet and innocent babies in real life. 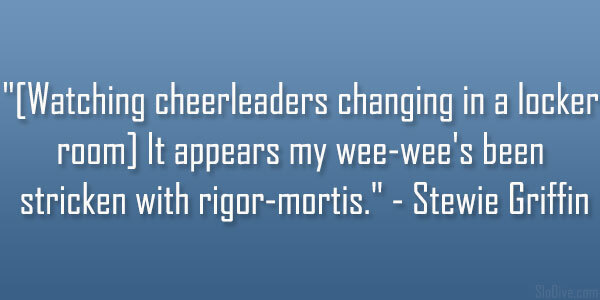 This animated character has violent thoughts and pictures raging through his tiny head. 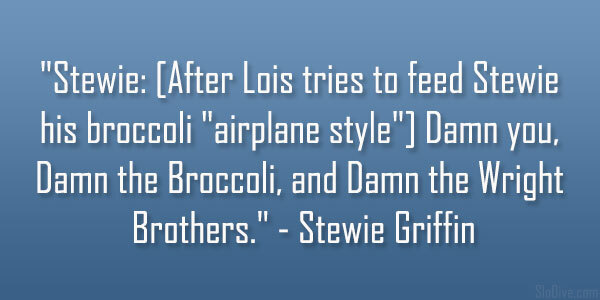 Stewie is also clued up to contemporary culture. 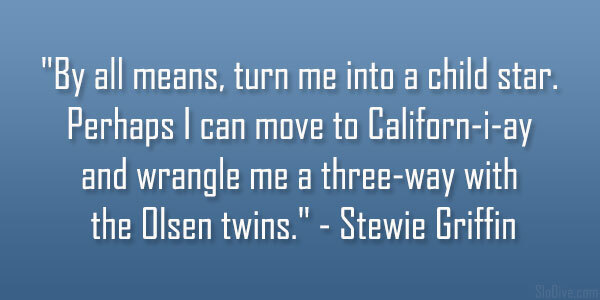 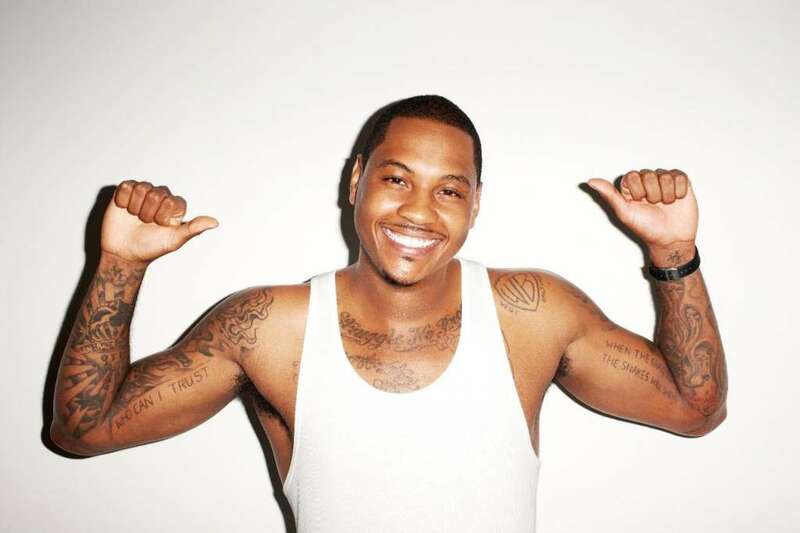 For example, in one memorable quote, he talks about becoming a child star and moving to California. 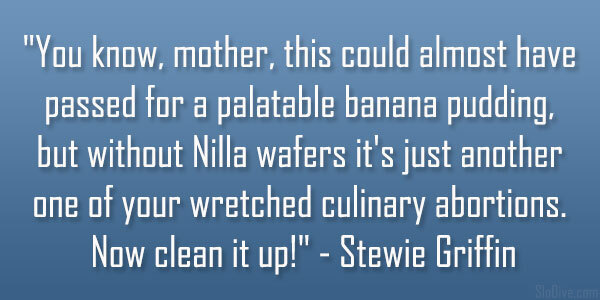 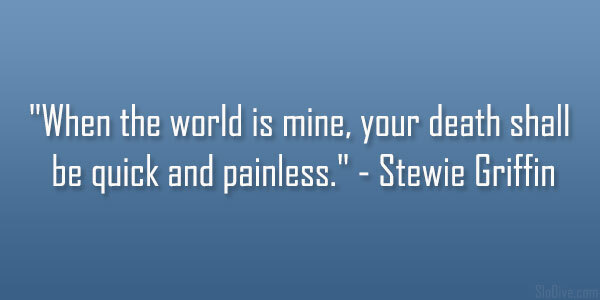 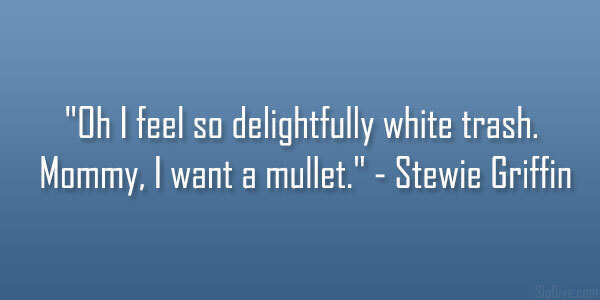 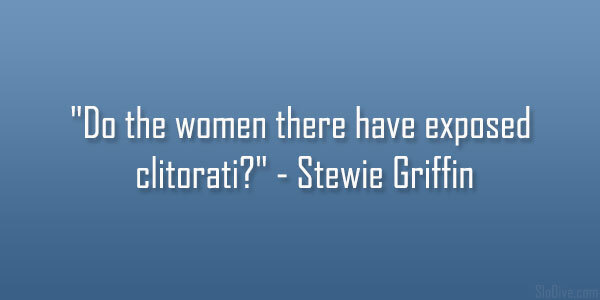 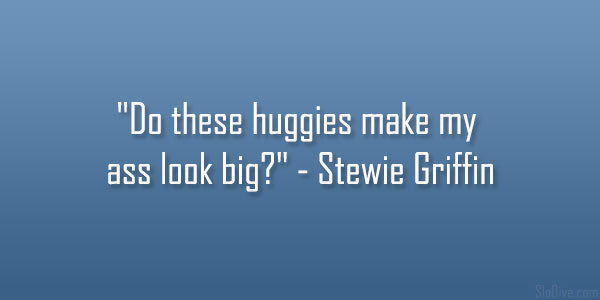 The best part of Stewie Griffin quotes is, how easily they bring complex words into a one-year-old’s vocabulary. 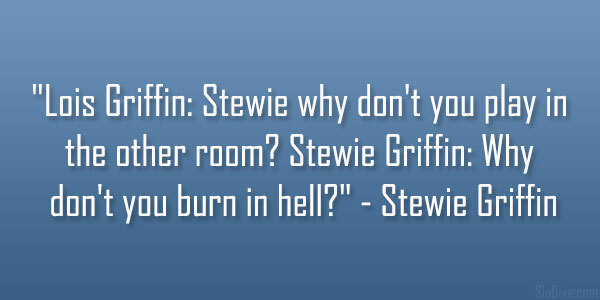 Stewie Griffin can gravely talk about rigor mortis, or shower his mother with wildly colorful phrases. 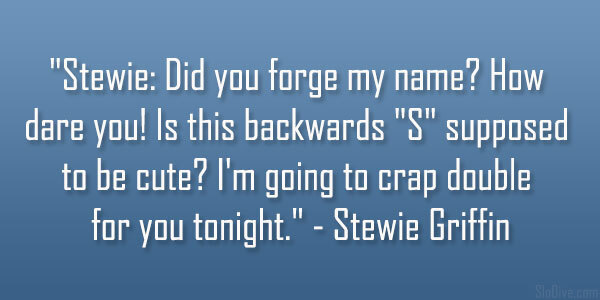 Cursing his mother is one of Stewie’s favorite hobbies. 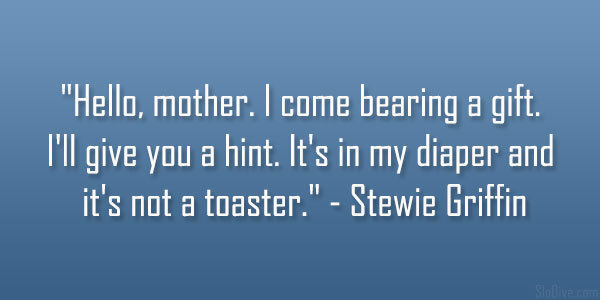 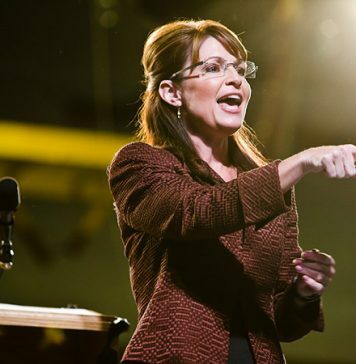 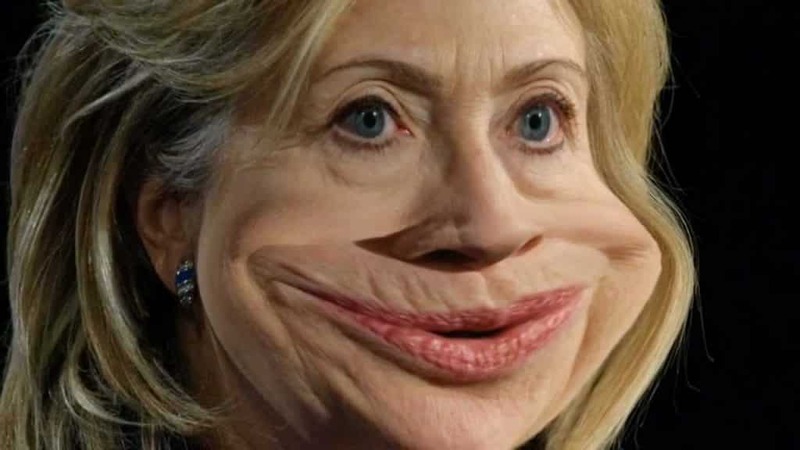 In a scandalous quote, he curses his mother for thwarting him, ever since he got out of her womb. 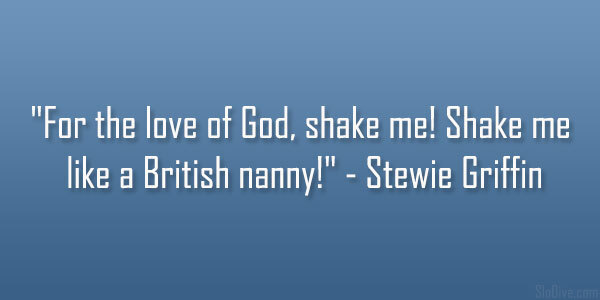 At the same time, Stewie displays totally baby like antics, such as peeing in his pants or crying to his mom to change his diaper. 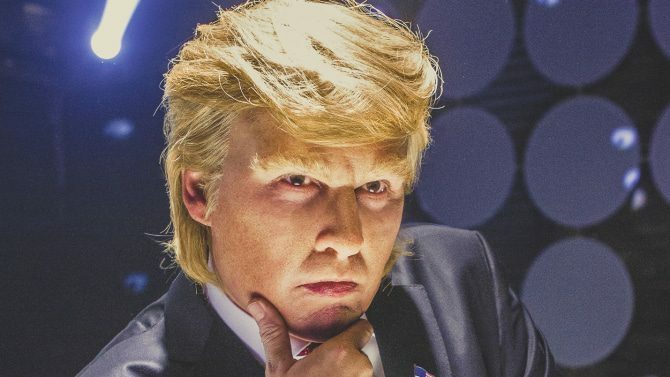 This bundle of quick and sinister energy, simply loves shocking viewers, with statements about God being deliciously evil. 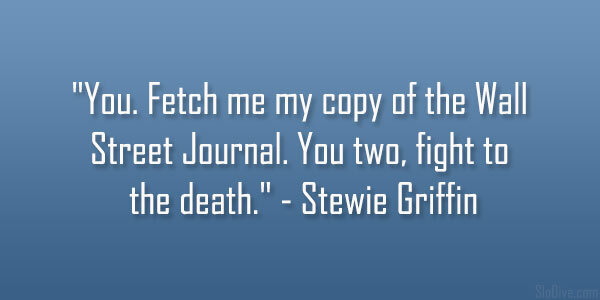 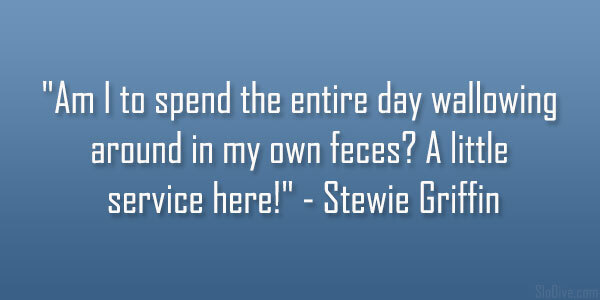 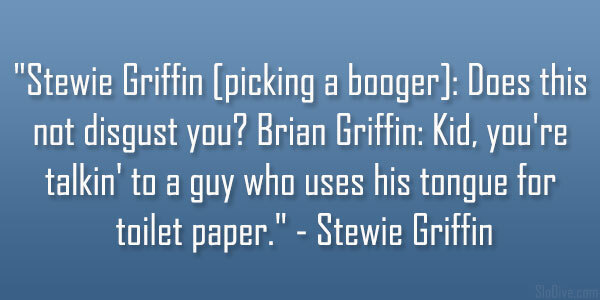 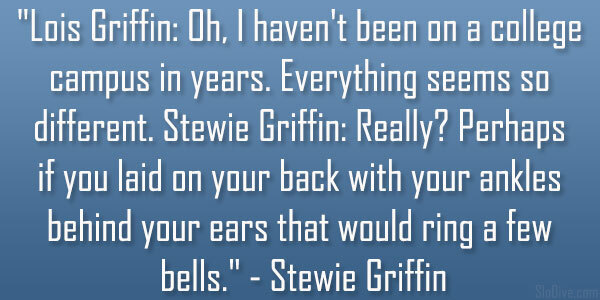 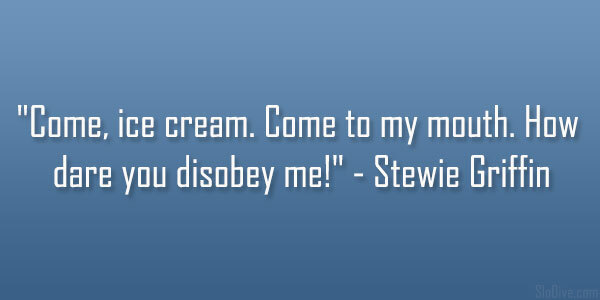 Here is a look at some popular Stewie Griffin quotes. 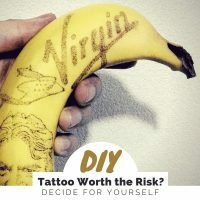 If you like this article, you might be interested in some of our other articles on Inspirational Graduation Quotes, Quotes About Being Beautiful, Good Love Quotes and Live Laugh Love Quotes. 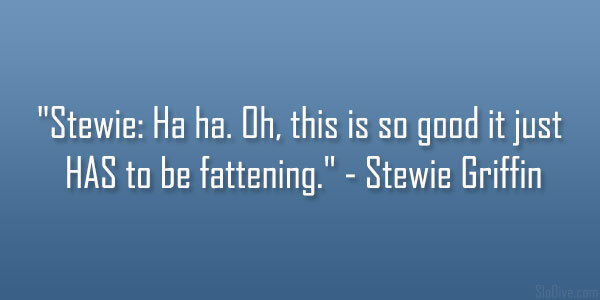 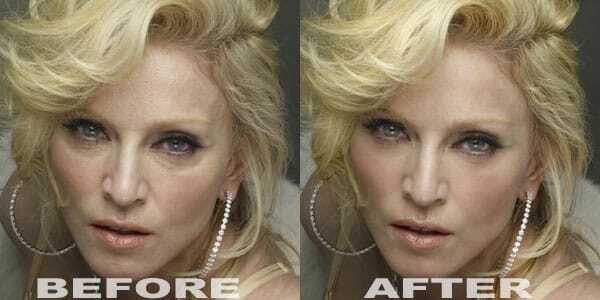 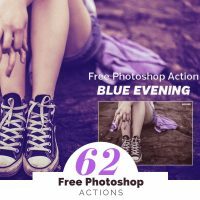 Wow these quotes are so much funny and its hard to stop laughing after reading these quotes. 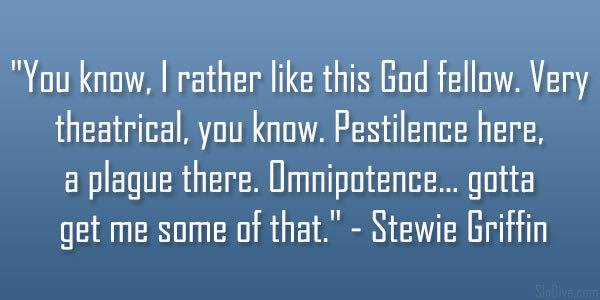 “I love God. 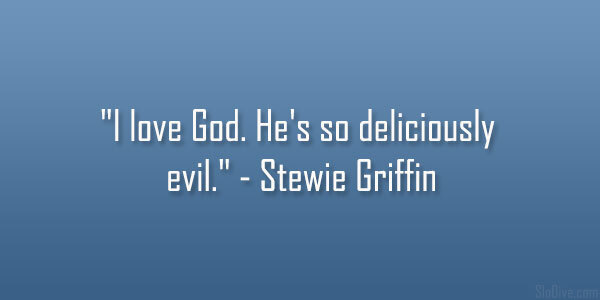 He‘s so deliciously evil.“ – Stewie Griffin is a very funny quote and these quote really make a person laugh who reads these quotes. 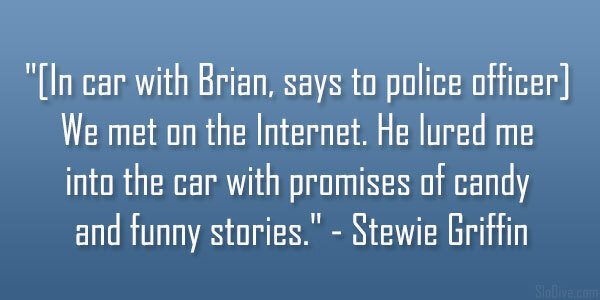 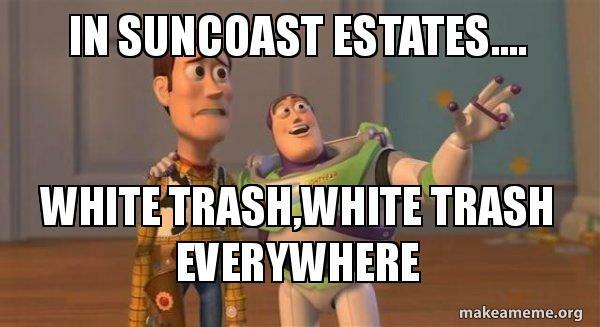 Hahaha… all of them are funny. 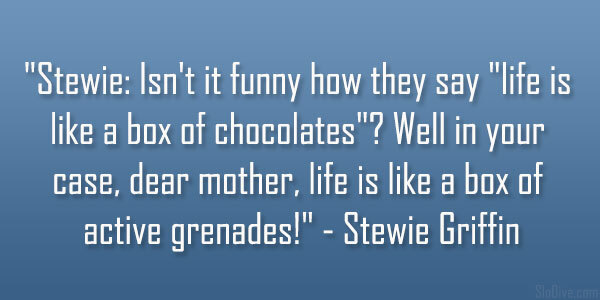 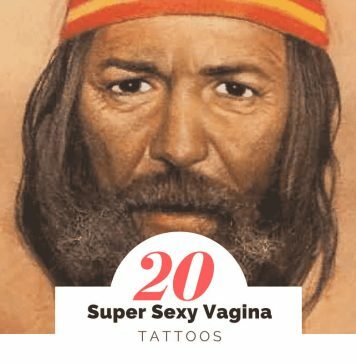 Nice collection of funny quotes. 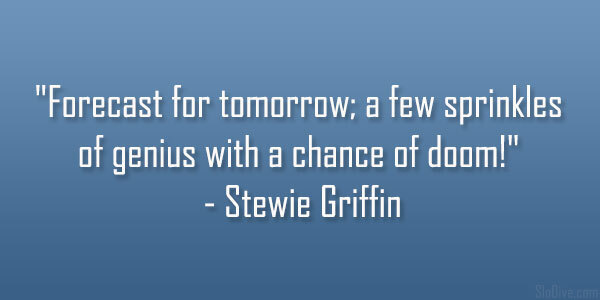 Thanks for the quotes from one of my favourite cartoon characters ever. 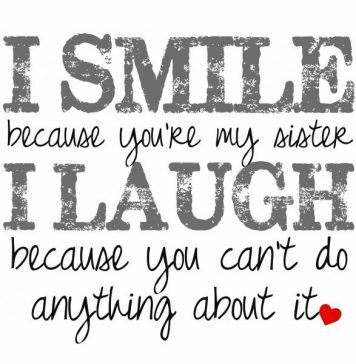 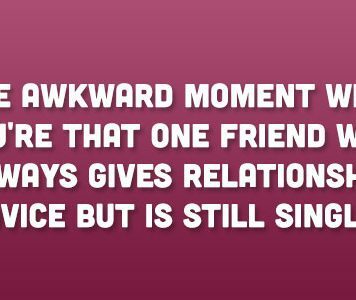 Really funny quotes i like these quotes very much they are so nice collection of funny quotes.